In the Driftless Area of Wisconsin, we are passionate about who we are and where we live, and this passion is visible in every aspect of day-to-day life here. We live in a unique and beautiful area, left untouched by the glacial forces that flattened so much of the Midwest. The vistas out over the forested hillsides and deep valleys alone will leave you breathless, and the diversity of activities to enjoy while in the Driftless Area will keep you entertained for days. No matter whether you’re coming from near or far, the Driftless Area should be at the top of your list for your next getaway destination. Settle in for a few days or more at our serene Vacation Rental, and start making the most of a Driftless Area getaway. The Driftless Area of Wisconsin is a unique region, defined by beautiful and dramatic bluffs that rise sharply in contract to the flat valleys below, which are criss-crossed by a network of rivers and streams. The great diversity of the landscapes found here provide the backdrop for a variety of outdoor recreation, from hiking, biking and birdwatching, to fishing and canoeing along the many rivers and streams. When we say there is something for everyone in the Driftless Area, we mean it. To experience the serenity of this beautiful region, we recommend a scenic canoe trip along the stunning Driftless Area rivers that gracefully wind along the valley floors. Book your room at our relaxing Vacation Rental in Soldiers Grove, and get ready to experience a deep sense of relaxation in the heart of Driftless Wisconsin. The Driftless Area of Wisconsin is a stunningly beautiful and unique region in Wisconsin, known for its picturesque river valleys and sharply rising bluffs. With so much natural beauty around us, it’s no surprise that many artists call the inspirational Driftless Area home. The hills and valleys here serve as perfect inspiration for a variety of artists, including painters, potters, woodworkers, weavers, poets, writers, and musicians. Spend days in Driftless Wisconsin visiting studios and galleries, or during the 3rd week in September, amazing local art can be seen at one spectacular event. Each year in September, art lovers from around the area head to Crawford County for the Driftless Area Art Festival. Rooms always book up fast for this annual event, so now is the perfect time to reserve your place at our centrally located Drifltess Area Vacation Rental. We mention time and time again how wonderful it is to spend time in the unique and beautiful region of Wisconsin that is called the Driftless Area, or Driftless Wisconsin, but we find that it’s something few people actually know much about. The Driftless Area is a region like no other in the Upper Mississippi River Basin. 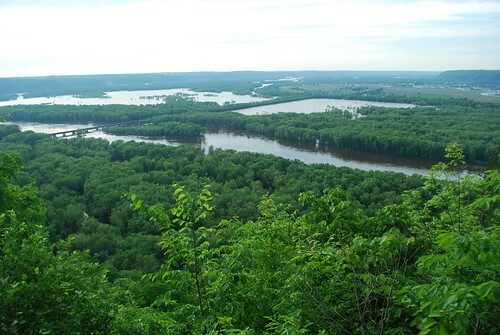 The unique geography of this region, where you’ll find deeply carved river valleys contrasted with steeply rising bluffs, was created as the last continental glacier melted 100,000 years ago, leaving it untouched by the glacial forces that shaped the remainder of the midwest. Our Vacation Rental is located in Soldiers Grove, Wisconsin, nestled on 100 beautiful acres in the heart of Driftless Wisconsin. Book a weekend with us today, and come explore the fascinating history and diverse landscapes of the Driftless Area. Every winter in Wisconsin feels like it will never end. Rest assured though that Spring always shows up, and the chance to partake in the wonderful winter recreational opportunities in the Driftless Area will be lost for another year! When milder temperatures are finally in the forecast, your opportunities for snowmobiling, skiing, and snowshoeing throughout Wisconsin quickly come to an end. Late winter/early spring is also the time of year where sugar maple trees are tapped, and wonderfully rich Wisconsin maple syrups are produced. Stay with us at our Soldiers Grove, Wisconsin Vacation Rental, where you can experience a Driftless Area winter getaway filled with plenty of charm and adventure.